Ever find yourself avoiding situations or people who do nice things for you? You want support, encouragement, valuable advice, or even a hug, but yet something inside of you knows that accepting it means you owe something. And so you avoid the people or experiences that leave you feeling indebted. But is there another way to go about giving and receiving that leaves both sides in a position of power and appreciation? Yes! 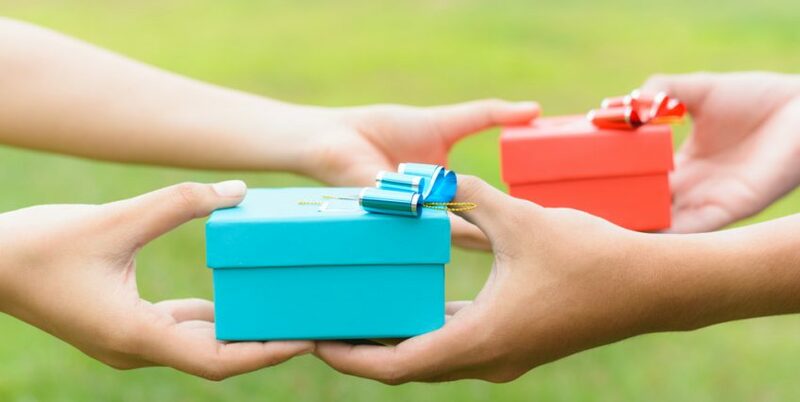 The law of reciprocity—if I give you something, you’ll feel compelled to give me something in return—has been used to since the beginning of time. In many cases our very survival depended on the law. For example, if I give you a coconut, you’ll give me a dozen eggs. Or, I will arrange for your daughter to marry my son provided you have a rich dowry. Or, if I make a connection that lands you a contract, you’ll make a connection for me or send me a check for a percentage of the sale. The law itself is actually quite useful in ensuring we have what we need to live, grow and prosper. It becomes destructive when we use the law in an attempt to manipulate others into doing what we want, based solely on our desires. Why You’re Motivated to Give? Recently I had a chance to experience the destructive impact of this of this law from both the giving and receiving side. In full disclosure, I’m embarrassed I (unknowingly) used this law to get a free refill of my favorite drink at a local coffee shop. Having visited this coffee shop a multiple times over a few months, I had gotten to know a couple of the baristas. We were on hugging terms. They appreciated the hugs and even treated me to a free refill on a couple of occasions, leading me to giving more hugs, compliments and appreciation. In my mind, it was a win/win—I love hugging, complimenting and acknowledging people. And, I love free refills. Initially, my intention behind giving the hug was good—I wanted to share love because doing so feels good for both parties. The connection is healing. Then, without realizing it, I started expecting free refills in exchange for my hug and kind words. While I didn’t know why the hugs began feeling hallow and disconnected, later that same day it occurred to me that I was essentially charging for hugs. Now I know—hugs and kind words create real connection only when I give for the pure bliss of giving. When the connection is missing, I know where to question my motives and correct course. Why Are They Being So Nice? Just a few weeks after this experience, I flew to California to deliver a speech at the Ritz Carlton in San Francisco. Upon arriving, I was greeted with open arms—several people wanted to carry my bags, hold the door, get me water and even walk me halfway down the street to ensure I knew how to get to the juice bar. As I made my way to the registration desk, I found myself feeling just a little uncomfortable. Initially, I thought this was because I’m simply not accustomed to that level of service. Then, I noticed a bit of embarrassment and shame creeping in, though I couldn’t quite figure out why. Afraid to check my bags, but needing to (my room wasn’t yet ready), I started paying attention to what was happening around me. Fives, tens and even twenty-dollar bills were easily making there way between guests and the incredibly kind employees. Not only did I not have much cash on me, I didn’t want to pay someone for his or her kindness. I don’t mind carrying my own bags, opening my own doors and getting my own water. I do, on the other hand, appreciate kind gestures and would have been delighted to accept it. And so I carried my own bags, and said “Thank you” every time they open a door. Secretly, I wished the company would simply charge more for their rooms, pay their attendants more, and encourage genuine kindness. If more companies did this, genuine connections would be the natural outcome of such kindness, and we could all feel less alone in the world. The question to ask before giving or receiving is—What are my (their) intentions? At some point we learn that focusing on helping people (succeed, grow and even get their bags to their room) puts the law of karma into motion. Such reciprocity doesn’t always come from the person you helped, but it always comes back. Focus on kindness and genuine connections and you’ll wind up with all you need and then some. Have you ever found yourself feeling indebted because you accepted a gift, gesture, connection or even a hug? How did you handle the situation? Would you do differently? Leave a comment below, or email me directly at Misti at Misti Burmeister.com.